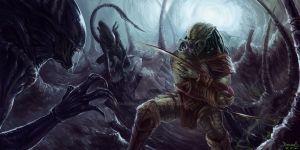 Whomever designed that weapon in-universe sure had a thing for the xenomorphs. Is the gun made of... Xenomorph? Lord-Neox, In the Dark Horse cross platform (Prometheus, Alien, Alien vs Predator, Predator) comic series, the main character gets a hold of an Engineer's weapon.